Unfortunately, other than the most prominent compliance goals, systems report falling short on many of their objectives. Our process compares goals to reality – creating a "gap analysis" with a prioritized work plan to achieve success. 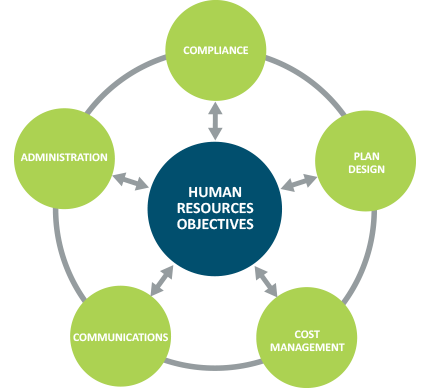 Gaps and work plan components fall into one of 5 categories shown in the graphic on the right – compliance, plan/process design, cost management, administration and communication. Each is linked to the other and each is critical to meeting your goals, and we stay to help you achieve them.